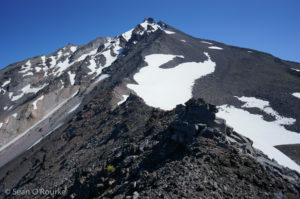 Mount Jefferson is the next volcano south of Adams along the Pacific rim. 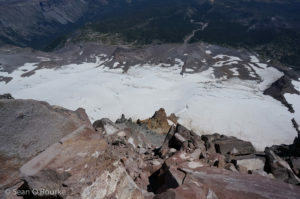 Though shorter than Adams, Jefferson is a much harder outing, with a lower start, longer approach, more cross-country travel, and a bit of steep snow and class 3-4 rock at the top. 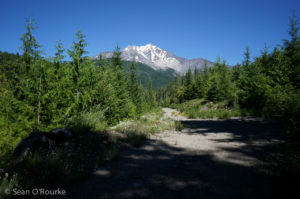 From Hood River, Google Maps figured out a tricksy way to get to the Pamelia Lake trailhead, linking two long, paved, single-lane forest roads to cut southwest from highway 93 to Detroit. Not having an Oregon atlas, I was a bit nervous following this winding tunnel through the forest for over an hour, but it worked as advertised, and I reached the trailhead at a reasonable hour. Not having read the instructions carefully, I discovered that Pamelia Lake Trail has an obnoxious special permit system. Normally I would just poach it, but there were signs bragging about $250 fines, and a Forest Service truck parked at the trailhead. I decided to deal with this problem in the morning, and went to sleep. Looking at the map in the morning, I happened to notice a forest road one drainage north that went to within a mile of the PCT, and decided to check it out. 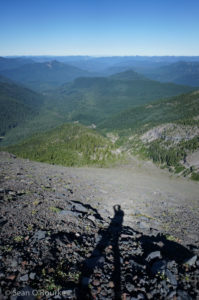 After time in the North Cascades, no mere mile of Oregon bushwhacking could be that bad. My plan worked better than expected: I drove a good road to a gate, hiked 1.6 miles of road to its end, then walked a mile through mostly open forest to the PCT. On the return, I found that there is even a faint trail on the ridge south of the end of the road. 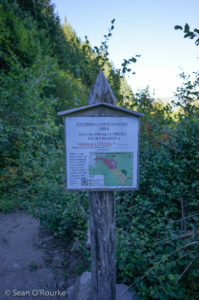 I passed a few through-hikers on my way south, as well as another $250 fine zone sign at the intersection with the normal route. I was undecided about whether to do the southwest ridge or the longer south ridge, but happened to notice the subtle cairn and use trail for the former. The route goes straight up a gully from the trail, eventually reaching a flatter area where the trail disappears beyond a cairn. From there, the best path seems to go up the left-hand side of a shallow valley. I am not sure of the best way to reach the ridge; I simply slogged up a horrid loose garbage-hill. All the volcanoes are chossy, but Jefferson seems to be in a league of its own. Once on the ridge I made better time, following a faint path and occasionally deviating onto the snow. The ridge crest was still loose, but less awful than the sides, and it was worth staying on the crest even when that required a bit of third class scrambling over steps. Much slogging later, I reached the “red saddle” below the summit knob, where the tricky business begins. From the south, the normal route traverses across a steep, permanent snowfield to the north side of the gray summit knob, where it is less steep and chossy. After my minimalist climb of Adams the day before, I had been feeling a bit absurd carrying my axe and crampons, but was glad I had the axe when I saw the traverse. People had installed a fresh boot-pack over the weekend, so I did not need crampons, but I cautiously planted my axe every other step. If you slip on the traverse, you won’t stop until you hit the rocks a few thousand feet below. Once past the traverse, I continued all the way around to a gully near the north end of the summit knob, where 10 minutes of class 3-4 climbing lead to the summit. Where a couple hundred people had probably summited Adams with me the day before, fewer than a hundred had summited Jefferson since the register had been placed in 2014. 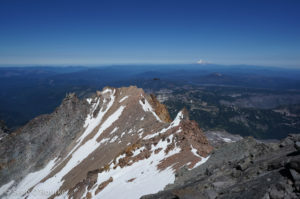 After taking in the view all the way to Rainier to the north, the Sisters and Bachelor to the south, and a decent-sized glacier below the vertical east face, I sat down to snack and enjoy the perfect day. Just as I was about to leave, I noticed a helicopter approaching the mountain, and stuck around to watch. It made a couple slow passes low over the glacier, seeming to pause at crevasse fields, then disappeared around the north side of the mountain. I started down, figuring the action was over, but the chopper returned to pass close enough to the summit that I could see the number, the red crosses on the military bird, and even the pilot and co-pilot. I waved, then continued down. Crossing the snowfield was trickier in the downward direction, but fortunately my good hand was uphill that way. 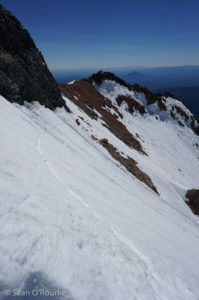 When I reached the red saddle again, I took off my pack to stow my axe and shove some snow in my bladder. The helicopter buzzed me once again, then went off to search the west face. They were clearly searching for someone, and had no idea where they should be looking. When I got home, I looked it up and confirmed that they were searching for (the remains of) Riley Zickel. After paying on the slog up, I reaped the rewards of a quick sand descent down the east side of the ridge, then down the garbage hill to the forest, where I stopped to pour gravel and a surprising amount of loamy soil from my shoes. I lucked onto the cairn at the top of the descent gully, then carefully stepped and slid back down to the PCT. I did not pass any hikers as I jogged north, and had the woods to myself for the remainder of an eight or nine hour day. Great trip report! Did you happen to see any possible camping spots after you were out of the permit zone? There are a few well-established PCTer spots next to Milk Creek, though that’s not far from the trailhead. I also found a constructed platform along the SW ridge, with snow for water not too far away. 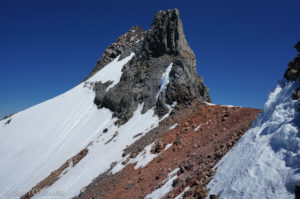 A dry camp would also be possible where the climbers’ trail flattens out after the initial steep climb. Excellent report! The pictures are fantastic. Do you have a gpx of your route? Thanks! I rarely GPX my routes, and this is no exception. The route around Pamelia is easy to find on the way out, but take a waypoint where you meet the PCT for the way back. The climbers’ trail is a bit less obvious: look for a cairn on the left where the trail crosses a gully near a large-ish boulder on the right, and go straight up the gully. Take a waypoint at the top of the gully for the way back, since it’s easy to wander in the broad upper valley on the way down.